Want a Green Card? Invest in Real Estate – COME MAKE IN INDIA.SELL ANYWHERE AROUND THE WORLD. Previous post: How to profit from inflation? Like many of her fellow classmates at New York University, Yanchu Zhao has a busy schedule. A college junior, she has a double major in economics and journalism, and juggles classes, an internship and life with roommates in a rental near Herald Square. So two years ago, Ms. Zhao’s parents invested $500,000 in a hotel project on Bryant Park, knowing that their investment could be parlayed into green cards for the family. Three months ago, their paperwork came through and the Zhaos became permanent residents of the United States. While Ms. Zhao’s father has remained in Beijing, her mother joined her in the United States and is now renting a studio on Roosevelt Island and studying English. Investing in real estate projects in exchange for legal immigration status has become big business in New York City. 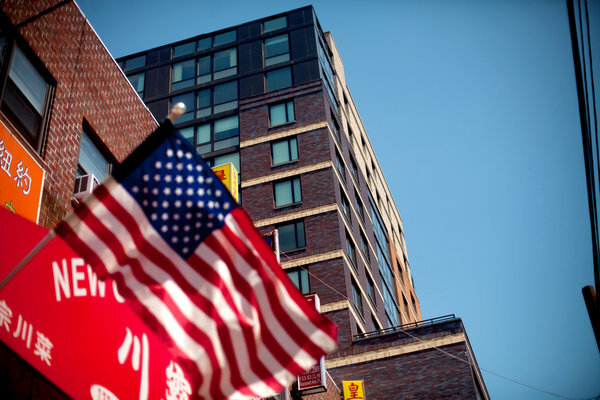 Through a federal visa program known as EB-5, foreigners, more than 80 percent of them from China, are investing billions of dollars in hotels, condominiums, office towers and public/private works in the hope it will result in green cards. Twelve-hundred foreigners have poured $600 million into projects at Hudson Yards; 1,154 have invested $577 million in Pacific ParkBrooklyn, the development formerly known as Atlantic Yards; and 500 have put $250 million into the Four Seasons hotel and condominium in the financial district. 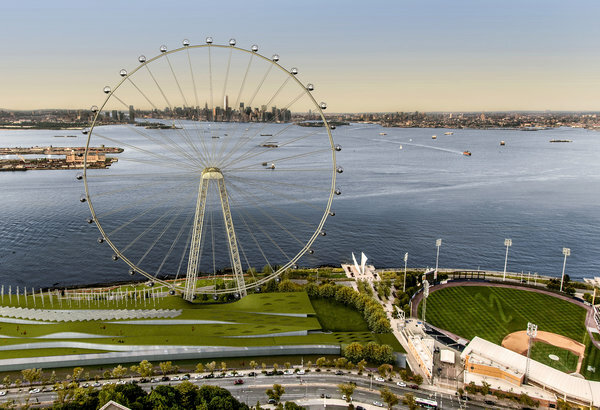 The list of projects involving EB-5 investments also includes the International Gem Tower on West 47th Street and the New York Wheel on Staten Island. Under the federal program, a foreigner who invests $500,000 — and in some instances, $1 million — in a project that will create at least 10 jobs can apply for a green card. It generally takes from 22 to 26 months to obtain legal residency through the program, as opposed to several years for other visa programs. While the EB-5 program has been around since 1990, it was only in the wake of the recession, when securing loans from traditional lenders became difficult, that companies began using it in earnest to raise money for projects. Any company is eligible as long as it hires 10 people per foreign investor. So, for example, a fast-food franchise can raise $1 million from two investors if it hires 20 employees. In the last four years, the program’s popularity has surged. In fiscal year 2010, 1,885 visas were issued. But by fiscal year 2013 that figure jumped 354 percent to 8,564, according to government data. Last year, the entire annual allotment of 10,000 visas had been claimed by August — before the end of the fiscal year in October. This year the quota was reached even earlier, on May 1. Under the program, the family of the investor, including any dependent under 21, can apply for a green card, and each family member is counted toward the quota. As most investors apply as a couple or a family, the supply is used up quickly. Numbers are hard to come by, but in fiscal year 2013, the most recent year available, investment through the visa program totaled $379 million inNew York State, according to data from Invest in the USA, an industry trade organization for the EB-5 program. That is 19 percent of the total investment in the program, second only to California, which makes up 22 percent. This is a major increase from previous years. Investment in New York State for fiscal years 2010 and 2011 combined only came to $327 million. 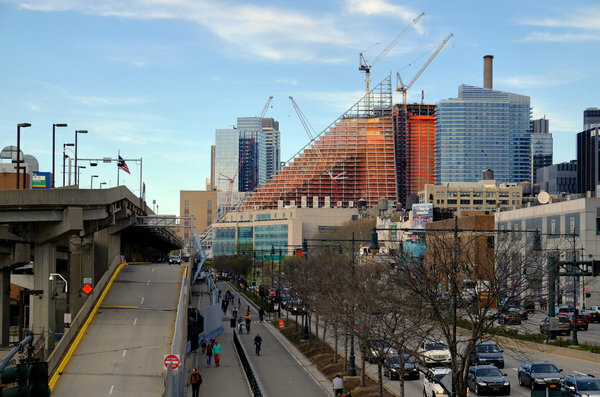 These numbers are low because the data lags, and do not include some of the more recent large-scale projects, like Hudson Yards. For foreign investors who have the money, the program can be an easy way to gain legal residency in the United States. In 2009, Yi Lin, 47, was working as a media executive in Shanghai when he began thinking of applying for a green card through the program. 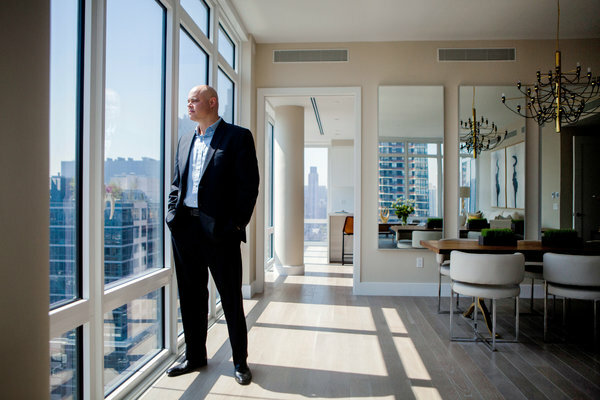 He spent two years researching developments, “looking from east to west and north to south,” before he settled on investing $500,000 in a mixed-use project in Miami. “You have to be very clear about the process and the project and how it is financed,” Mr. Lin said. “Unfortunately, many Chinese are clear about the immigration process, but are not familiar with the project they are investing in.” It is important, he said, because if a project fails, foreigners can lose both their investment and the opportunity to secure a green card. For Gary Lai, the program is about his children. Mr. Lai, who manufactures women’s apparel, has no plans to leave Taiwan, where he lives. But he wanted to obtain green cards for his son, who is in his third year at the University of California, Irvine, and his teenage daughter, who is in boarding school in California. “My wife comes every few months to see the children, but the green card will make it easier,” Mr. Lai said. 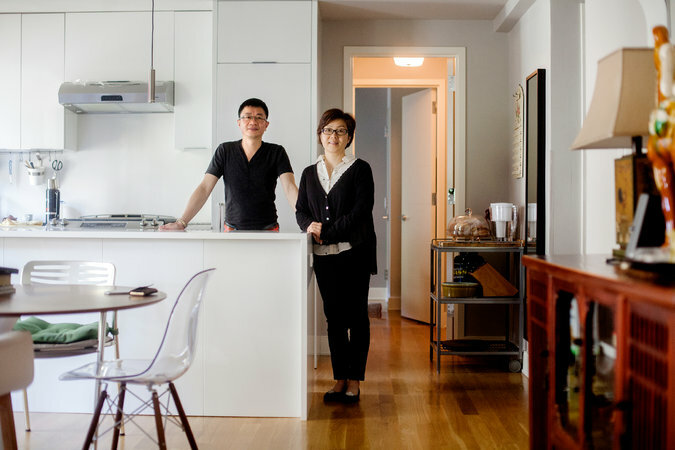 “It will also help my son when he graduates to find a job.” After considering several projects, Mr. Lai invested $500,000 in One Fulton Square, a mixed-use project in Flushing, Queens. Mr. Lin and Mr. Lai are typical of the investors in this program, said Daniel Chang, the head of the Asia desk for the Nikki Field team at Sotheby’s International Realty. “It is really for middle-class and upper-middle-class Chinese, and many are doing it for their children,” Mr. Chang said. “This program is not for the very rich in China, because the superwealthy do not want to pay U.S. taxes.” Instead, he said, the wealthiest Chinese prefer to have their legal residences in low tax jurisdictions like Hong Kong or Singapore, and then take advantage of 10-year tourist visas to the United States. For developers, finding middle-class investors who can prove that their $500,000 investment comes from legitimate endeavors, and who will pass muster with immigration officials, can be tricky. Identifying investors is a competitive business. Often, developers hire so-called immigration agents in China who use their networks to find investors. Developers also take the search for investors in their projects on the road, primarily to China. These presentations can be sedate or flashy affairs. “We had one where they started off with a dance program and a light show,” said Gary M. Rosenberg, a partner of the law firm Rosenberg & Estis, which represents the Durst Organization. 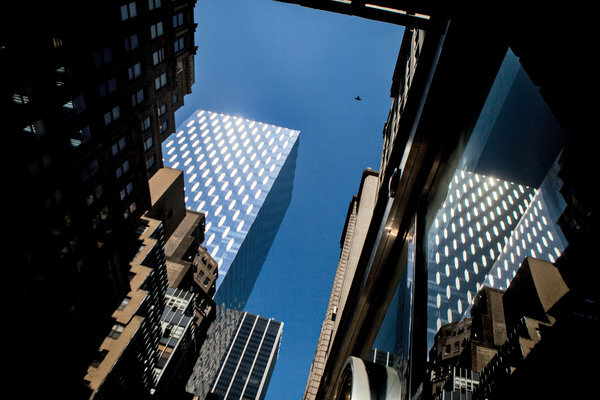 Foreign investors put $200 million into Via, a rental building Durst is developing on West 57th Street, and $80 million into Durst’s mixed-use project at 855 Avenue of the Americas; the financing represents about 25 percent of the total cost of the two projects. Mr. Rosenberg said the roadshow for these projects included an M.C., trivia games and prizes. “The first 100 people who signed up to make a $500,000 commitment that day were given iPads,” he said. Developers are eager to access the visa program because it is cheaper than many other financing sources. This is in large part because the participants are focused on securing green cards and are therefore willing to take smaller returns on their investment, typically earning less than 1 percent. “It is a good financing vehicle,” said Asaf Shuster, the vice president for business development of the Victor Group, which is raising $90 million from 180 foreign investors for a 60-story condominium at 281 Fifth Avenue. The project’s total budget is roughly $400 million, and “in order to build such a big project, you need a lot of equity and a big stack of financing,” Mr. Shuster said. Before the advent of the visa program, the company would have taken out a loan and paid around 12 percent in interest, “but EB-5 money can be as low as 5 percent,” he said. Developers pay the costly immigration agents, as well as legal fees and other expenses, said Mr. Finkelstein, who is advising the Victor Group on 281 Fifth Avenue. But while the program can make sense for foreigners and developers, several well-documented cases of fraud have occurred, primarily involving developers who misrepresented themselves to investors and then failed to deliver a completed project. And while a traditional commercial bank pays close attention to construction schedules and dispenses funds as the project proceeds, EB-5 investors deliver lump sums, so a developer could spend the money before the project is complete and wind up with a funding shortfall. Another criticism of the program is its lack of transparency and oversight. Even the program’s proponents have called for improvements. “We would like to see enhanced interagency collaboration,” said Peter D. Joseph, the executive director of Invest in the USA. For instance, the group hopes for more cooperation between the United States Citizenship and Immigration Services, the arm of the Department of Homeland Security, that runs the program, and other government commissions and departments. The trade group also backs enhanced authority for Citizenship and Immigration Services to reject investors, and supports more site visits by regulators to projects. “It takes a lot of work to make a transparent market and we are continuing to work to improve this,” Mr. Joseph said. One aspect that has come under scrutiny is location. Projects are supposed to be in areas of high unemployment, yet are in prosperous neighborhoods like Midtown, Chelsea and TriBeCa. This is because developers are allowed to incorporate contiguous census tracts in their calculations. Pacific Park Brooklyn, for example, is on the border of wealthy brownstone Brooklyn neighborhoods, yet relied on high unemployment figures from areas of Crown Heights and Bedford-Stuyvesant to make its case. Parts of the visa program are up for renewal in September, and Congress is likely to address some concerns; the rapidly snapped-up 10,000-visa allotment may be among them. “It is going to be fixed and they will reshuffle the number of visas to make more available,” said Mona Shah, an immigration lawyer who specializes in the visa program. There is also a good chance that the $500,000 investment threshold will be raised, an effort that Invest in the USA supports, and the practice of using contiguous census tracts may be curtailed. Ending such gerrymandering could have major ramifications in New York, as there are few areas of Manhattan, for example, that have high enough unemployment rates to qualify. In the meantime, “the market is still a bit like the Wild West,” said Min Chan, a lawyer and associate real estate broker at City Connections. The brokerage firm is applying for a license to assist developers with the visa program, one of the first brokerage firms to do so. “There are a lot of people out there who don’t know what they are doing. It is very complicated, and there are a lot of I’s to dot and T’s to cross. A version of this article appears in print on May 17, 2015, on page RE1 of the New York edition with the headline: The Green-Card Carrot .